Henry HAMBRIGHT [Parents] was born about 1782 in , York, South Carolina. He died in 1820. Henry married Anna B. STEWART. Anna B. STEWART was born in 1782 in Near King's Creek, York, South Carolina. Anna married Henry HAMBRIGHT. Rev. 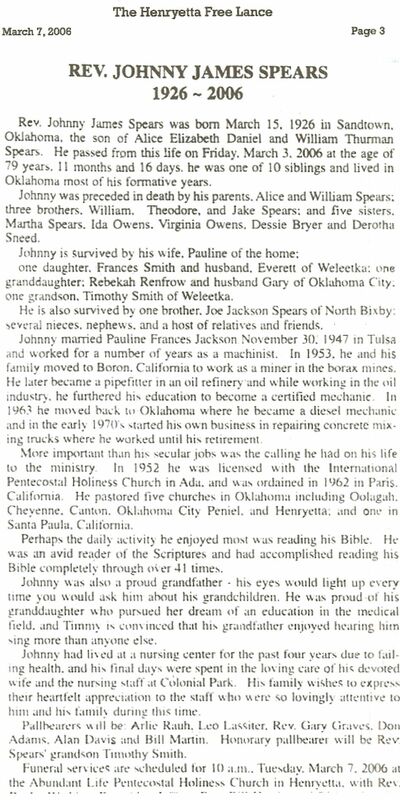 Johnnie James SPEARS [Parents] was born on 15 Mar 1926 in Santown, Sequoya, Oklahoma. He died on 3 Mar 2006 in Colonial Park Nursing Center, , Oklahoma. He was buried on 7 Mar 2006 in Westlawn Cemetery, Henryetta, Oklahoma. Johnnie married Pauline Frances JACKSON on 30 Nov 1947 in Tulsa, Tulsa, Oklahoma. Pauline Frances JACKSON. Pauline married Rev. Johnnie James SPEARS on 30 Nov 1947 in Tulsa, Tulsa, Oklahoma. F i Martha Frances SPEARS was born on 23 Aug 1948. Joe Jackson SPEARS [Parents] was born on 29 Nov 1931. He died on 7 Sep 2007. Joe married Lucille JACKSON. Lucille JACKSON. Lucille married Joe Jackson SPEARS. Phillie SPEARS was born on 17 Mar 1953. Branda Gale SPEARS was born on 30 Nov 1957. Larry Joe SPEARS was born on 11 Dec 1961. Clyde Richard ARY [Parents] was born on 29 Jul 1917 in Stigler, Haskell, Oklahoma. He died on 25 Dec 1999 in Muskogee Hospital, Muskogee, Oklahoma. He was buried on 28 Dec 1999 in Whitefield Cemetery near Stigler, Le Flore, Oklahoma. Clyde married Velma Josephine FOLSOM on 27 Oct 1940 in Russellville, Pope, Arkansas. Velma Josephine FOLSOM was born on 28 Dec 1925. She died on 5 Oct 2009 in At her home. She was buried in Whitefield, Haskell, Oklahoma. Velma married Clyde Richard ARY on 27 Oct 1940 in Russellville, Pope, Arkansas. Sgt. Bobby Lee ARY was born on 7 Jul 1946. He died on 21 Mar 1993 in Muskogee, Muskogee, Oklahoma. He was buried in Quinton Cemetery, Quinton, Haskell, Texas. F v Bonita J. ARY was born about 1949. F viii Janet Clydene ARY was born on 1 Sep 1955. J. D. WHITFORD was born in 1916. He died in 1984. J. D. WHITFORD married Zelma Pearl ARY. Zelma Pearl ARY [Parents] was born on 11 Aug 1919 in Stigler, Haskell, Oklahoma. Zelma married J. D. WHITFORD. F iv Patsy Caroline WHITFORD was born in 1943. F vi Caron Joyce WHITFORD. Gene MATTOCKS. Gene married Caron Joyce WHITFORD. Caron Joyce WHITFORD [Parents]. Caron married Gene MATTOCKS. GILBERT. GILBERT married Caron Joyce WHITFORD. Caron Joyce WHITFORD [Parents]. Caron married GILBERT. Sidney Odell PARKER [Parents] was born on 25 Feb 1930 in Quinton, Pittsburg, Oklahoma. He died in Jul 1978 from Cancer . Sidney married Mary Jo GARVIN. Mary Jo GARVIN. Mary married Sidney Odell PARKER. Michael Dale PARKER was born on 18 Oct 1952 in McAlester, Pittsburg, Oklahoma. Richard Dan PARKER was born on 8 Feb 1959 in Tulsa, Tulsa, Oklahoma. Oletta Lynn PARKER was born on 17 Jul 1963 in Tulsa, Tulsa, Oklahoma. Ceaf Sylvester HIGGINS [Parents] was born on 20 Jan 1912 in Beaver Mountain Community, Haskell, Oklahoma. He died on 11 Aug 1982 in Saint Francis Hospital, Tulsa, Tulsa, Oklahoma from Result of injuries sustained in a car wreck. He was buried in Mountain Home Cemetery, S. Whitefield, Haskell, Oklahoma. Ceaf married Tennessee Virginia "Tennie" SPEARS. Tennessee Virginia "Tennie" SPEARS [Parents] was born on 29 Nov 1914. She died on 26 Jul 2008 in , , Oklahoma. She was buried on 29 Jul 2008. Tennessee married Ceaf Sylvester HIGGINS. F i Billie Ruth HIGGINS was born on 22 Oct 1933. M ii Ceaf Alfred HIGGINS was born on 19 Oct 1935. M iii Ivan Keith HIGGINS was born on 30 Sep 1937. F iv Doralene HIGGINS was born on 29 Nov 1939. She died on 10 Feb 2009. F v Donna Fay HIGGINS was born on 18 Feb 1942. F vi Joyce Ellen HIGGINS was born on 14 Dec 1943. M vii Bobby Ray HIGGINS was born on 22 May 1949. He died on 9 Nov 2006. Alva Wayland MC KIBBON was born on 19 Nov 1911 in , Haskell, Oklahoma. He died on 21 May 1992 in , Pittsburg, Oklahoma. He was buried in Mt. Home Cemetery, Stigler, Haskell, Oklahoma. Alva married Lola May SPEARS. Lola May SPEARS [Parents] was born on 29 May 1917 in Mountain Home, Haskell, Oklahoma. She died on 25 Oct 1995 in McAlester Regional Medical Center, McAlester, Pittsubrg, Oklahoma. She was buried in Mountain Home Cemetery, Stigler, Haskell, Oklahoma. Lola married Alva Wayland MC KIBBON. Glenna Jean MC KIBBON was born on 1 Jun 1941. She died on 7 Apr 1942. She was buried in Mountain Home Cemetery, Stigler, Haskell, Oklahoma. Glennon Dearel MC KIBBON was born on 30 Aug 1943. Richard Dale MC KIBBON was born on 1 Jul 1947. M iv James Lealand MC KIBBON was born on 15 Aug 1951. He died on 7 Feb 2009.